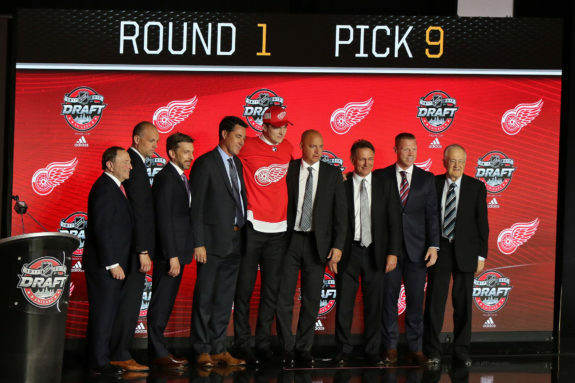 The Detroit Red Wings certainly had a plan coming into last weekend’s draft. Nine of the 11 picks the Red Wings had were used on players who are at least 6-foot-2 and five of the 11 picks are defensemen. So, how did the Red Wings do in this year’s draft? For this week’s Grind Line, we discuss what we liked, what we didn’t like and if we thought the Red Wings filled their needs. There was a mixed reaction to the Red Wings’ selections at the 2017 NHL draft. They went into the weekend with an impressive 11 draft picks, but the consensus is that the quality did not match up to the quantity. I had a similar reaction at first, but I am glad management addressed the team’s needs at center and on defense. Undoubtedly, the most criticism came when the Wings selected Rasmussen with the ninth overall pick in the draft. Gabriel Vilardi — who projects to have a higher offensive ceiling — still was on the board when the team took Rasmussen. In fact, there were a number of prospects with higher offensive upsides available to the Red Wings at that time, but management appeared set on selecting the hulking forward, citing his maturity and character as big reasons behind his selection. Two picks that caught my attention for a different reason were third-round selection Petruzzelli and fourth-round selection Setkov. Petruzzelli is a 6-foot-5, 190-pound goaltender who spent last season in the USHL with the Muskegon Lumberjacks and posted a 2.40 goal-against average and .918 save percentage. Due to his size, he is able to cover a lot down low, but he also possesses the athleticism to move around the net efficiently. 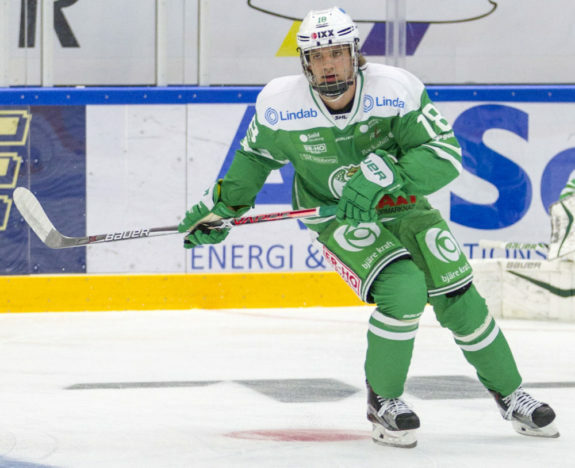 Setkov is a 6-foot-6, 192-pound defenseman who notched 12 points through 38 games with the Malmo Redhawks J20 last season. He moves around the ice well for someone his size and plays with a physical edge. Though his offensive contributions do not stand out, Setkov made great strides over the course of last year and should continue to improve. The Red Wings set out to get bigger and deeper at center and on defense; they accomplished just that. That said, I cannot help but feel a bit underwhelmed with how they did this year. Obviously, it is far too early to tell what kind of players the prospects will turn into, but hopefully, a number of them can exceed expectations. I guess Rasmussen was “their guy.” But perhaps the Red Wings were a little too eager to get their guy. Rasmussen was a fine pick — a 6-foot-5 center with offensive upside, ability to win faceoffs and can contribute on the power play. Detroit just should have traded back to select him. The Athletic Detroit’s Craig Custance reported the Red Wings did receive calls to trade back but opted to stand pat. They got calls to move out of the No. 9 spot and could have rolled the dice that Rasmussen, or a similar talent, would have been available later to pick up more picks. Those additional picks might have allowed them to take Lindstrom closer to his projected slot and it’s a win-win. It’s unclear who called and where they would have picked if they traded back. But based on the picks that came after Rasmussen, they could have conceivably moved back at least five slots without risking another team picking the hulking center. Reaching is fine when you pick in the 20s and the players available aren’t that different from one another. But when you have the ninth overall pick — the highest Red Wings draft pick since 1990 — you can’t reach when there are game-changers available. If Rasmussen turns into a franchise center, that’s great. His development will certainly be watched closely over the next decade. The same can be said about Martin Necas, Gabriel Vilardi, Owen Tippett, and Timothy Liljegren — top players passed over by Detroit. As for the rest of their draft, the Red Wings did fine. Lindstrom, Petruzzelli and Adams were intriguing picks. But apart from Petruzzelli, there really weren’t any “steals.” We’ll just have to wait and see how these 11 players turn out to really get a feel for how the Red Wings’ first draft of the rebuild went. When The Grind Line did its predictions in May regarding whom the Red Wings would draft, I originally said Rasmussen would be a good selection, but that was under the assumption Vilardi, Tippett, Necas and Liljegren would already have been selected. None of those players had been selected, so the Rasmussen pick doesn’t sit well with me. 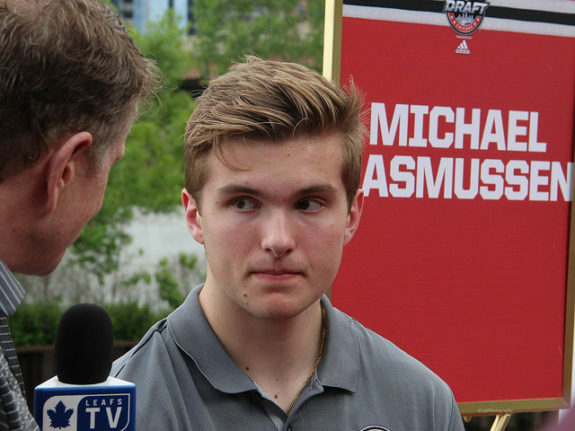 Especially considering if the Red Wings were set on picking Rasmussen, they could have traded the ninth pick and taken him later in the first round. Of course, Rasmussen could turn out to be a promising pick and fill the center void in the future. However, there were better selections out there, and the Red Wings missed an opportunity. In addition to poor skating, the knock on Rasumussen is whether he can score at five on five. He registered just 15 points at five on five in 50 games last season, which is 27 percent of his point total. Since about 83 percent of the game is played at five on five, this stat has to concern Red Wings fans. On the flip side, it means he knows how to produce on the power play, which is an area the Red Wings need help, as they had the 27th-worst power play last season (15.1 percent). One scout likened Rasmussen to former Red Wing Tomas Holmstrom, and while that’s a nice distinction, I hope that isn’t the reason the Red Wings chose him. Holmstrom was a key player for the Red Wings during the late 1990s and 2000s, but the game today is all about speed, something Holmstrom certainly lacked. As far as the other Red Wings’ picks go, I’m glad they addressed their issue on the blue line by drafting five defensemen. The lack of defensive prospects has been hurting the Red Wings, and they started to address it two years ago, selecting three defensemen in 2016 and two in 2015 after selecting none in 2014 and none until the fifth round in 2013. Nicklas Lidstrom said second-round pick Lindstrom “is good with the puck and good at finding open players with his first pass.” That’s high praise from the seven-time Norris Trophy winner. The Red Wings also selected the USHL’s leading goal scorer last year in Adams. He had 37 goals and 23 assists in 60 games for Fargo last season in the USHL. 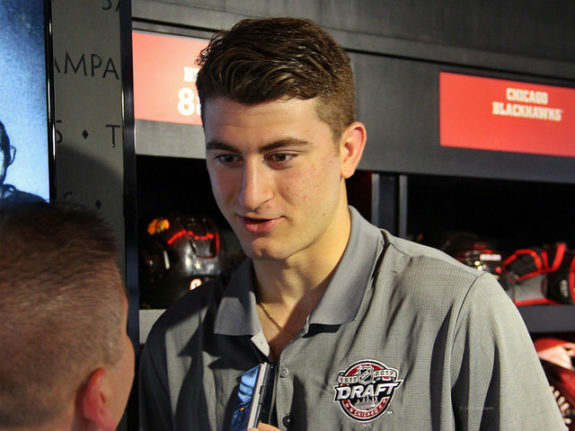 We know the Red Wings like homegrown talent, and they continue to draft players playing in the area, selecting the Muskegon Lumberjacks’ Petruzzelli in the third round and the Saginaw Spirit’s Gilmour in the seventh round. Petruzzelli had a 22-10-1 record with a .918 save percentage but did not fare as well in the playoffs, playing in just two games with an .885 save percentage. Gilmour played well on a Spirit team that did not reach the playoffs, scoring 47 points in 65 games. Of course, a lot can happen between now and when these prospects begin their pro careers. However, from an “on paper” standpoint, the Red Wings could have done better.